Corneal topography is a procedure in which the front part of the eye, the cornea, is imaged and then analyzed via computer software, resulting in a topographical map which displays the exact shape of the eye. 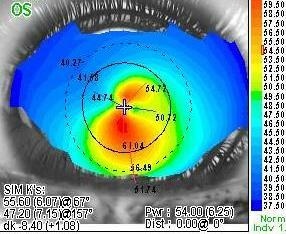 Corneal topography gives your eye doctor the ability to interpret the shape of the front surface of your eye. Utilizing advance corneal mapping instrumentation, our doctors are able to detect corneal irregularities and diseases that cannot be seen with the human eye alone. Dr. Rebarchik performs corneal topography for all specialty contact lens fittings to aid him in designing lenses that are custom fit to the unique shape of your eyes.